How to plan a reunion… That's why you're here, isn't it? 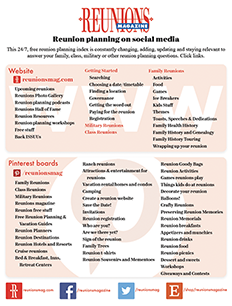 You want to learn how to plan a reunion or learn how others plan reunions. There is recently a notable increase in the number of articles about “how to plan a reunion,” “rules for planning a reunion,” “help planning your reunion!” Since we like to think that's what we do, but in a much larger way than an article in a newspaper, we wanted to share excerpts from these articles as well because many have some unique ideas from their authors, most of whom had either just planned or, more likely, attended a reunion and they were moved to tell about it. Since our space in the magazine is always limited by the level of support for each and every issue, it is not practical for us to add these stories to print. Instead, we are creating this section and to make it really simple, we're calling it “how to plan a reunion!” Unique, no? But to the point and easy for you to both remember and find, when you want to read it! Francis Talton, longtime planner of the Malone Family Reunion, has been the speaker at Family Reunion Conferences in Flint, Michigan. These were some of her suggestions. You have to start somewhere. It doesn't take a large family to have a reunion! Don't get overwhelmed and don't be afraid to ask for help! Determine who is interested. Nine times out of ten everyone will want to have a reunion, they just want someone to take the reigns. Start locally. Then as word gets out about how much fun it was, more family will want to attend the following year! When first starting a reunion or starting after many years: keep it simple! Social media can be your best tool to reach nonlocal as well as local family members. Nowadays even grandma has a facebook page. Helpful also are Instagram and Twitter, both free. If you have older family members who do not use social media, use the phone. Create a "family group page" on Facebook. Your group can be open to everyone or closed (by invite only though everyone can see who's in it) or secret (no one but group members can see posts). I chose "Closed" in case distant relatives want to join! When? Check dates and choose something that will accommodate everyone; perhaps a holiday or weekend leading to a holiday. Most people are off on summer holidays and kids are not in school. One day or the whole weekend? Don't bite off more than you can chew. One day at a park is a good start for any size reunion. Where? Choose a location such as a park that has activities for adults and children. Make sure there is parking, restrooms, pavilions in case of inclement weather and wheelchair accessible, if needed. Also popular for family reunion is a dinner cruise; great if you don't want to spend time cooking! Buffet lunch and dinner cruises are available. Cost? Will you charge for dues, food, t-shirts, etc? What amount will each family or individual be asked to contribute? Or will you just ask each family to prepare a dish to pass for a small gathering. Set up a PayPal account for out of town family, checking account dedicated to the reunion and get a Square Reader or online account (ie: myevent.com) to accept credit card and debit/checking account. Invite family members and announce your family reunion plans. Be patient...stay focused and watch your hard work speak for itself! Happy planning! Reported by Francis D. Talton, Flint, Michigan. 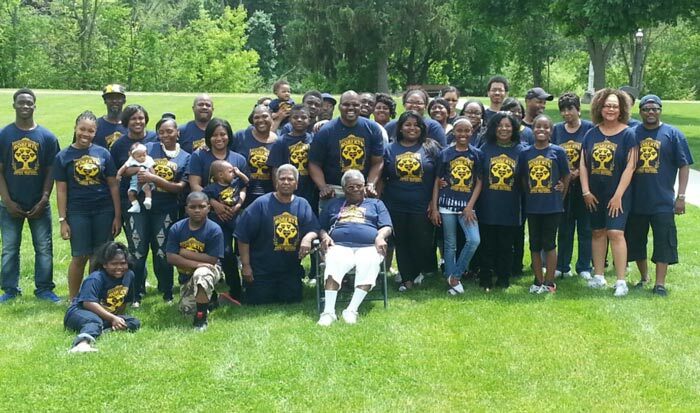 See her story about her mother's Roberts Family Reunion, Keep Calm and Plan On! in the February 2016 issue Reunions magazine's special Reunion Celebrations issue. Looking to attend a reunion workshops, conferences or seminar? Click here!